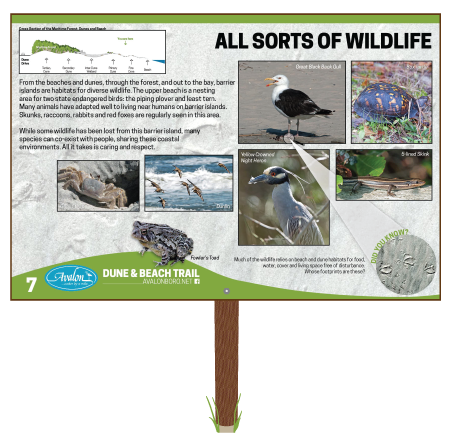 The Avalon Dune and Beach Trail is a home to all sorts of wildlife because it has many small ecosystems within a confined area. At different times of the year, completely different species use the beach, the dune system, and the maritime forest as a migration stop, a breeding ground, or as a permanent home. For example, Monarch Butterflies can be seen in the last weeks of September as they stop to feed on plants like Seaside Goldenrod and Milkweed. In the summer, parts of the beach are blocked off to save crucial beach habitat for endangered, threatened, and rare shorebirds such as the Least tern, American Oyster Catcher and Piping Plover. 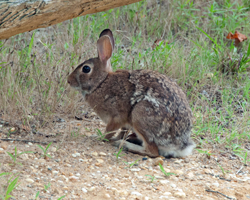 In addition to the various shorebird species on the beach, the trail is host to a variety of mammals, including raccoons and rabbits, reptiles, such as a Five Lined Skink, the Eastern Box Turtle, and amphibians, like the Fowler’s Toad. As you walk through each section of the trail, you walk into a different habitat with different species in it. 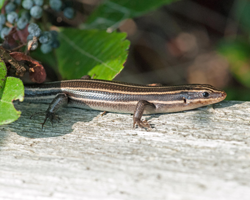 You will most likely find the mammals and reptiles close to the maritime forest, but as you walk further, into the sun, you may be able to see a Five Lined Skink sunning itself on the railing just past the forest and songbirds hanging out in the swale behind the primary dunes. The magic of the trail lies in the unexpected encounters you may have with wildlife and is dependent on the day, the time of day, the season, and the weather. 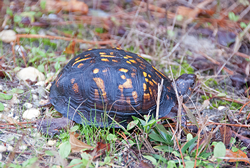 Try to keep a count of all the different wildlife you encounter on the 1.1 mile walk.